My daughter in law Manjiree and her two sisters are great animal welfare activists and their homes are proof that they are. In our home we have Chutki, rescued as a pup, a victim of a hit and run accident with both her hind legs fractured who was nursed to health and normalcy by Manjiree. She was originally found and brought to us by Anjali, one of the sisters who you will get to meet later in this blog post. In Manjiree’s maternal home there are two rescued dogs being brought up by her parents. 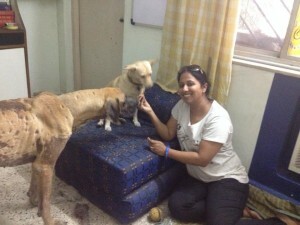 The other sister Vandana has a home full of rescued dogs and she keeps fostering as well. The latest in these rescue stories is a Great Dane that the girls have named as Jordan. He was found abandoned and ill about to die. Manjiree with the help of Blue Cross arranged for him to be taken from the roadside and cared for and when the Blue Cross facilities could not manage him, he was shifted to some other activist’s place to be cared for. Since that activist has other commitments, Manjiree has brought Jordan home to care for for a few days. These are two photographs of Jordan being brought down from an upstairs flat where he was being cared for before he was brought to our place and one with him and Chutki in our home along with Anjali. As I write this, it has been two nights since Jordan came home and he has slowly gained enough confidence that he will not be abused and moves freely around. Chutki on the other hand is irritated that she has competition for attention but so far no major scraps have taken place. It is a fine balancing act that all of us are having to perform to keep her in good humour! 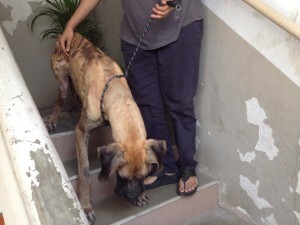 This entry was posted in Family, Pets and tagged Animal rescue, Blue Cross, Great Dane. Bookmark the permalink. 28 Responses to Foster Home. I love how your life and love has expanded so very much! It is still an ongoing experience with totally unexpected twists and turns. Some recent happenings have been puzzling as well as educational but I have refrained from writing about them because the people involved are well known by now to my readers. But, yes, love and life have expanded a great deal. Kudos to each one of them who were determined to make Jordan healty!!! Wow brilliant…. Welcome to my blog Neha. I hope that you will read all my posts and comment. A truly funny situation has developed. Our home is at two levels. Since Jordan finds it difficult to climb the stair case and keeps slipping back, he has decided to stay downstairs and Chutki has laid claim to the upstairs portion. Chutki is one smart pup! it breaks my heart to see him in such condition. but now he can relax a little and know kindness. BLESS the girls and ranjan for all the work they do! fostering is important … but it must be hard … they just get used to being loved and cared for and settle a bit in new surroundings … and then it has to change yet once again. they must wonder… will there ever be a home for me? great danes are so gentle. we call them the gentle giants here. Thank you for blessing me Tammy. The credit goes entirely to the youngsters. I am just the record keeper. He is recovering fast but is very attached to Manjiree and I am already dreading the day when he will have to go to his permanent home for readjustment. Having gone through such traumatic times, one more separation for him is frightening to me. That’s good for Chutki too! Foster care is so important for some rescued animals. Members of our local Friends of the Shelter do it often. And our Montana had been fostered. When she came to Kaitlin and Torben’s she was afraid at first when they visited Torben’s folks because she was afraid she was going to be left again. She’s really blossomed now at K and T’s, but when they had the crisis with Sammy she became her old quiet and watchful self for a while. It breaks your heart to think of what they’ve gone through. You are so right CM. Jordan is recovering fast but is also getting very attached to Manjiree and that is going to be a problem when he eventually moves to his permanent home. I love the story and your family support for animals. I am a dog lover myself but currently without a dog. I am missing a doggy friend but my life style and moving around the world stops me from getting one. You are welcome here anytime during your travels to play around with Chutki and any other guest that may be around at that time. Sounds like an open house. I always wanted to go to India but missed some chances. Now, Chutki is such magnet, that who knows? Yes, it is an open house in more ways than just being so for Jordan. I hope that you will get to see it personally and experience its warmth. What wonderful people Manjiree and her sisters must be! They are as are their parents and spouses too. Here’s my rescue hound Ginger…. And a handsome fellow he is too. That he is and he has settled down well in his new environs and is a treat for the new family. Thank you. I did not know full details. I was just asked permission to host him and I gave it. My role in the affair started and ended there. This is just so amazing that Jordan has such another chance. Love the photos!